BREED GROUP: Working WEIGHT: 100 to 200 lbs HEIGHT: 23 to 28 inches COLOR(S): Solid tan with white. 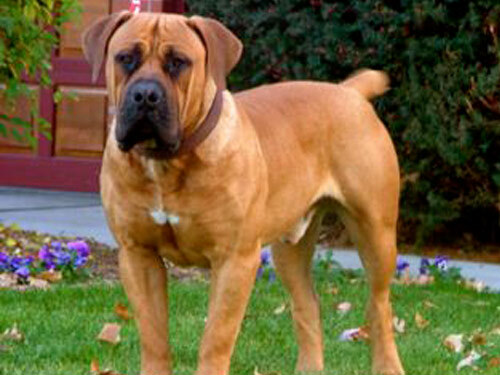 Coming from South Africa, the Boerboel is a large working molosser breed of dog. The Boerboel breed was named for the Afrikaans/Dutch word “boer” meaning “farmer” which captures the spirit of this “farmer’s dog.” This dog was historically bred in South Africa with the purpose of guarding the homestead. Although it is uncertain which dog breeds the Boerbel originated from, it is believed that the dog derived from interbreeding of indigenous African species with breeds brought by Dutch, French and British settlers. When responsibly bred, well-socialized Boerboels will be even-tempered and wanting to please their family. They seek companionship from their owners and thrive on love and attention. This dog breed is dominant and intelligent, featuring a strong watchdog instinct. They are generally self-assured and fearless, while staying responsive to the needs of their family. They should not be left alone on a regular basis for extended periods of time since, like most other working breeds, they can become destructive without the opportunity to fulfill a well-defined role. Before making a Boerboel part of your family, be prepared to spend much of the first year with the puppy on training. Receiving proper training and obedience classes early in life from a reputable local trainer can greatly reduce the chances of future dog bites and aggressive instances. To further prevent this aggression, socialize your Boerboel with many people, children, friends, extended family members and other dogs as a young puppy, as well as throughout its life. Avoid leaving this breed alone and unsupervised with young children it doesn’t know well or strangers. While it is rare for a Boerboel to bite a person, it must be noted that this and any other large breed of dog can cause serious damage if it attacks. The Boerboel is an average shedder that is easy to groom. This breed requires the occasional brushing and a monthly bath. The Boerboel has a typical life expectancy of 12 years. This breed of dog is susceptible to hip and elbow dysplasia as well as Wobblers disease. Other potential health concerns include eye problems, heart issues, thyroid problems, bloating, vaginal hyperplasia, and allergies. Boerboels love to be active, play and enjoy a good game of ball. Exercise can be gained from a large yard with ample running space and a minimum of a long daily walk. Obedience training at a young age is advised for Boerboel puppies and dogs. This breed is naturally obedient, intelligent and is the most protective dog breed that is not aggressive. They have strong territorial instincts, especially in domestic situations, and are confident, as well as dominant in their environments. They crave human companionship and should not be left alone for extended periods of time, since they can become destructive, reckless or dangerous like any large animal.